Commercial Artisan (James and Jon Sholly--OG LUNA family) bring the heat with this thin-lined, minimal beauty of a design! iwant design breaking that type A P A R T! 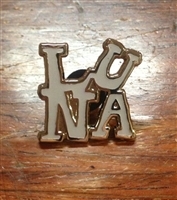 iwant works some LUNA logo zoom action. We love it! Jon Rogers has done us the favor of creating a beautiful LUNA octopus! We really like this guy! 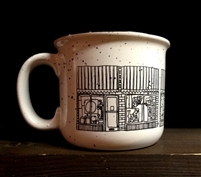 Get yr camping on with our ceramic (not tin) Storefront Mug! Replete with the very rad Nat Russell illustration from our 20th Anniversary Lathe-Cut Box Set! Keep your feet sweet with these LUNA music / Nat Russell Yeti Socks! Crooked Arm, on the one—once again! 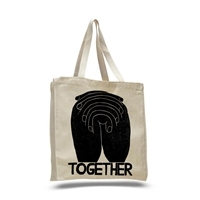 We are pleased and proud to offer the limited-edition NATHANIEL RUSSELL 'TOGETHER' benefit tote pack! -"RESIST FEAR ASSIST LOVE" button, produced by Busy Beave r Button Co.
"Two years ago, I made the "RESIST FEAR ASSIST LOVE" image--the day after the president was elected. It quickly spread across the world and was made available for free to anybody who wanted it. Soon after, the demand for a t-shirt of the image was so great that we (myself and my friends LUNA music and Crystal Graphics) made two runs of shirts and were able to raise thousands of dollars--with 100% of the profits going to local and national organizations (The Julian Center and Planned Parenthood of Indiana and Kentucky). It was a good feeling to contribute in a positive and practical way to those organizations in a time filled with so much hopelessness and sadness. It has been incredible to see that image appear in business windows, private homes, protest signs, and stickers all over the planet. The image was made to share, and it seems to endure. I was recently asked to create a print for another fundraiser for detained immigrant children. I made "TOGETHER" (with my friends at Bloom Screen Printing in Oakland) and was able to raise some more funds for an assisting legal organization. This new print seemed to match the spirit of the "RESIST FEAR ASSIST LOVE" image, and I began to talk with Todd Robinson of LUNA music about how we could do another fundraising project that paired the two. The result of that conversation was to continue to make these physical objects--as a way to spread a message of kindness, hope, and love. Our hope is that we can send a spirit of we-are-in-this-together-ness into the world, while raising funds for organizations that do the real, hard work of community support and involvement. Every time we put up a sticker, wear a button, show off a tote bag, or put a postcard in our window, there is the chance that somebody will see it, and it will resonate with them, and they will carry that image and feeling with them the rest of the day--or week--or month or year. Just like the previous projects, 100% of the funds raised (after material costs) will be donated to love-assisting agencies. This year, donations will be split between two Indianapolis organizations: The Julian Center (an organization that supports victims of domestic violence, sexual assault, and other life crises) and the FACE Low Cost Animal Clinic. None of this would be possible without the support and hard work of LUNA music, Crystal Graphics, Cat Head Press, and Busy Beaver Button Co.--who have all generously donated time and materials to the creation and distribution of this project. Their support and hard work has made this entire project possible." 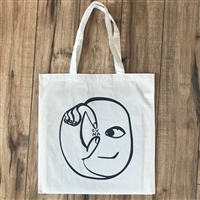 >To maximize the $$$ donated, we will be printing the bags to order ( PRE-ORDER BEGINS MONDAY, 01 OCTOBER 2018 AND WILL CLOSE ON SUNDAY 07 OCTOBER 2018)--please order the quantity you'd like, as this might be your only chance! >'TOGETHER' PACKS WILL BEGIN SHIPPING THE LAST WEEK OF OCTOBER. >THANK YOU FOR YOUR SUPPORT OF THIS PROJECT!! You're used to playing your records on your turntable—but have your ever "played" your slipmat? DESIGNED AND ILLUSTRATED BY BrainTwins—THIS ONE IS ACTIVATED BY YOU! 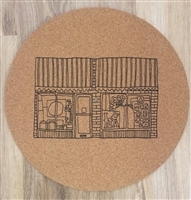 We'd like to introduce you to the first LUNA music Animated Zoetrope Cork Slipmat! 1. PLACE THE (BEAUTIFUL) 2-COLOR SLIPMAT ON YOUR TURNTABLE. 2. >>> D/L THIS APP at ZOESTROBE. 3. TURN OUT THE LIGHTS. 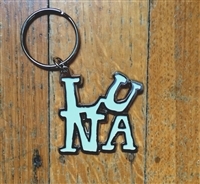 >>only available at LUNA music!! 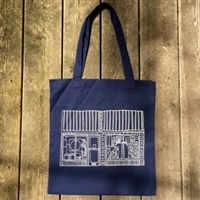 Here is--the LUNA music beach bag / beer transporter / picnic helper / yarn stash! 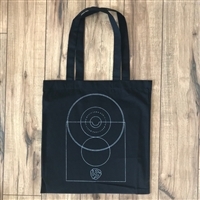 This bad-boy big-tote (measuring in at 23"w x 17"h x 6"d) is made of 100% heavy cotton canvas and comes with a velcro closure--it's the perfect throw and go bag! 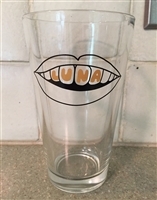 We are stoked to have this irreverent take on our identity, by our pal, for our first ever LUNA pint glass!